Renderings from Sky, Moinian Group's luxury rental rising at 605 W. 42nd St. The building has both affordable and market rate units, for instance affordable one-bedrooms in the building cost $931 a month while market-rate one-bedrooms were listed for $4,656. MANHATTAN — Can you afford $3,482 a month for a one-bedroom or $5,044 for a two-bedroom? New York City rents have grown increasingly unaffordable, experts said. Even the landlords know it. 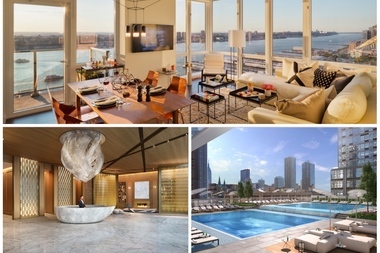 The rents listed above were the median in Manhattan for February, according to a report released Thursday from Douglas Elliman, which also found that landlord freebies, like a free month’s rent or paying the broker’s fee, doubled to 19 percent, its highest point in nearly 6 years. Though the median rent for Manhattan’s one-bedrooms barely grew from the past year, increasing a mere 0.2 percent, and the median rent for two-bedrooms decreased 4 percent from the year before, these rents are still out of league for many New Yorkers. The continued uptick in concessions — which allows landlords to keep prices high while effectively reducing what tenants pay during a year's lease — reflects that, many said. Gary Malin, President of Citi Habitats — whose rental report found that 25 percent of the transactions its agents brokered in Manhattan offered a free month’s rent and/or payment of the broker fee — echoed the sentiment. The share of new leases that included concessions jumped in Brooklyn, too, nearly tripling to 13 percent from about 5 percent, according to the Elliman report. Along with those concessions, price growth in Brooklyn surpassed that in Manhattan. The median rent for one-bedrooms in Brooklyn rose 8 percent to $2,611 a month. The median rent for two-bedrooms in the borough jumped nearly 11 percent to $3,167 a month, the Elliman report noted. In Northwest Queens — the only part of the borough the Elliman report focuses on, which includes Long Island City — the median rent for one-bedrooms hit $2,954 a month in February, up more than 18 percent from the previous year. The median for two-bedrooms was $4,089, up nearly 6 percent. Rents have become increasingly unaffordable between 2006 and 2014, when median prices increased by 15 percent, according to a report released this week from NYU Furman Center and Capital One. As prices increased, so did the rent burden: 55 percent of New York renters were paying more than 30 percent of their income on rent in 2014, up from 51 percent in 2006, the study found. And the percentage of those considered severely rent burdened — meaning they’re paying more than half their income on rent — jumped to 30 percent in 2014 from 27 percent in 2006. A recent poll from NY1/Baruch College poll showed that affordable housing was the most important issue to New Yorkers. A fifth of those polled said affordable housing was a bigger issue than crime, jobs and the economy. Housing was the No. 1 issue for a variety of groups, including women, black and Latino New Yorkers and those under 50. It was the No. 1 issue for those with incomes less than $100,000 as well as those with incomes more than $100,000. Nearly two-thirds of the 827 New Yorkers polled said they expected to be priced out of their neighborhoods in the next few years.